Trimming Threads and Ripping Seams Who Wants To Do It? Let me be the first to say that I hate mindless detail work even when it is necessary. Trimming those little threads and ripping out seams can cut my creative energy short and has on many of occasions. Yesterday I was finishing up some pillow cases (a birthday gift to a girlfriend who's birthday was Jan 24th...yikes), the sausage style pattern...you know the one. If not, you can find it here. Apparently I didn't line up the fabric evenly and I needed to tear out the threads. My favorite seam rip is the Famore "grim ripper"...LOL but I didn't want to take the time to pick at the edge of the threads to start the ripping. Thankfully Aaron, my oldest "co-worker" was home from school and he assisted me in the following video. In the photo above, you can see I made the "sausage" and later noticed I had not caught all the fabric layers. That's when I took out the Quick Ripper and went to work. You can see the video below. Keep in mind, my videographer is not well paid and he was only armed with an I-Phone...LOL. I was so impressed with the speed of the Quick Ripper that it has become a "must have" for mindless threads and ripping. When I went to roll and press my seams I noticed all those annoying little threads. I know I have a ton of scissors and really nice ones too....but the speed at which I trimmed those little threads was amazing. I held the Quick Ripper parallel to the fabric and raced along the edge and it took every single little thread off. And those thread tails too!! This "wild" set of pillow cases went to Jean because she left all her Westminster fabrics with me and I had to make sure I made excellent use of some of it :) I'm not sure it is even possible to sleep on such electric pillowcases. This set of pillow cases were sent to my girlfriend who's birthday was last January....better late than never ay! I made this set because it coordinates with "Momma's Quilt" and I wanted to use up the left over fabric. I bet you can't see any little dangling threads on any of these pillow case sets thanks to my new favorite tool, the Quick Ripper. 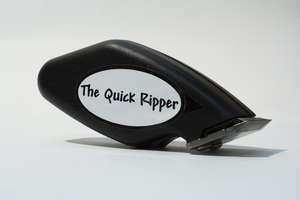 The Quick Ripper uses a single AA battery that is included. Everyone who knows me knows that I don't like to spend money or acquire tools that I don't think are worth the money or that I won't use frequently. The Quick Ripper is high on my list because of the value and speed. You may have noticed I used a sewing bird to hold the end of my "sausage" so I could use both hands to rip the seams. You could also lower your needle and presser foot into one end and use your sewing machine to hold the end. The flamingos are doing well....and apparently all well behaved as they return to school. Naturally there was a great booth of Creative Grids Rulers....after all, Creative Grids (my all time favorite rulers of all time) is distributed by Checker Distributors. Rita Fishel is a designer for Creative Grids Rulers and she spent the day demonstrating how several of the new rulers work. Did you know that Creative Grids rulers are made in the USA and their website has videos of how to use every ruler they make? I save all the instructions that come with my rulers but if you loose one, you can always check their website to refresh your memory! If you have a smart phone, the rulers also have a QR Code (the white box looking graphic) that you can scan to see the instructions via your smart phone. Susan O'Very from Sealed With A Stitch had some really fun Machine Embroidery designs to show us. The Key Covers (includes 22 designs) were the first to grab my attention. My sister has no less than 5 keys associated with her new condo and she definitely needs some of these fun key ...not funky...but fun key covers to help her quickly identify the right key. The Enchanted Notions designs made for a fun quilt as well as fun ideas for decorating your sewing space. Enchanted London....now where were these designs when I was making the quilt for my daughter and son in law? I could have had an absolute ball with these designs and the label would have been much cooler too. The gals from Violette Field Threads just may have been the prettiest two gals in the place (except for Waldo and I of course...giggles). Their line of children's clothing patterns are some of the nicest I've seen in a while. If you have young children in your family you will most definitely want to check out their website HERE. Can you see the most precious little girl going to her first day of pre-school wearing this delightful outfit? I can....come on grand children (fingers crossed). Waldo has a 5 year old grand daughter who would be precious in this fun skirt. I can just see her now...twirling in circles. Lisa Archer of Pickle Pie Designs had lots of new designs on display. The Kitchen is Closed designs are so much fun. There are 20 designs and you know I can come up with a zillion more reasons to close the kitchen! The little aprons have a pocket in them and I think there needs one that says, Tipping the Cook is Expected! I took a double take when I saw this table runner featured in Fast & Furious Home. Isn't this so neat? Now that is a fun take making a table runner! Twas The Night is a very fun Christmas Quilt. I loved the placemat patterns by Eazy Peazy Sew So Easy. This beautiful quilt from is in Penny Haren's new book, Quilt Block Fusion. The Checker Open House was excellent again this year. They really went out of their way to make sure everyone was comfortable, had plenty to drink and well educated about the latest and greatest in the world of sewing and quilting. I was particularly impressed with the shuttle provided to take us back to our cars. My sincere appreciation goes out to all the great people at Checker Distributor and to Rob Krieger....THANK YOU for another great Open House. I have a bit more time today so I'll give you more of the skinny about my take on Checker Distributor's recent open house. Julie Creus of La Todera Sewing and Craft Patterns had a fun booth. Every time I see one of her flowers I can't help but smile. I'm not much of a "fru fru" type of gal...more of an LL Bean sort....but I'm telling you I've always loved Julie's flowers and can easily see them on my house shoes or on a pen like she had in her booth. Isn't it just fabulous? I would have loved to have some of these made up when my mother was ill. I know she would have just loved having those on her slippers. An easy and wonderful gift! Speaking of wonderful gifts, La Todera also has some wonderful pin cushion patterns too!!! The Urchin Pincushion would make a perfect baby gift...something that could be easily washed. Bosal Fiber and Foam had a long line of shop owners in front of his booth. I know the quick placemats have been the rage for awhile now and Bosal now has them in round and hexagon shapes. These placemats on the kitchen table would bring a smile to anyone's face. You can find several placemat patterns HERE and the Bosal Forms HERE if you are interested in bringing some fun to your kitchen table. Waldo sat down to take a break and met a fascinating and fun gentleman, Dalen Keys. Dalen writes children's books and he gave Waldo/Rosemary a copy of "The Mess" for her grand daughter. I asked him about his other books and he shared about his writing of "Just A Quilt" and "Charles T. Cup." He was a lot of fun to talk to and you can see by his face that he has a lot of joy to share. What luck to run into him and to learn more about his books! There were a few machine embroidery designers at the Open House. If you enjoy machine embroidery than you have probably heard of Lunch Box Quilts designs. About Trout is one of their designs and this has to be one of the best About Trout's that I've seen. I loved the fabric and all the fishing lures. I'd say this lure is the "cats meow" but that would be too corny since the Cat Design is laying next to it. Fancy Feathers was displayed on the front of the booth and it really grabbed me. My mother loved birds and the minute I saw these birds I thought of her and warmth filled my heart. (For those of you who don't know, my mother passed recently.) Such a cheerful remembrance for me. Once again I've got this enormous Elephant that I need to eat (co-workers, work, house, you know what I mean) so I'll have to come back and post more about Checker's Open House soon. A quick reminder, if you have not voted for your favorites in the Pets On Quilts Show yet....NOW is the time to do it. August means Checker Distributor Open House and this year is as wonderful as the previous years. This year I have had the great fortune of meeting one of my favorite applique artists, Karen Kay Buckley. Karen's DVD, Hand and Machine Applique the Karen Kay Buckley Way, is how I became acquainted with Karen. She does an EXCELLENT job of teaching both hand and machine applique. I wanted to be in her living room with her after watching the DVD....ever have that happen? Fiesta Mexico is Karen's latest pattern and she took Best Of Show in Paducah this year. 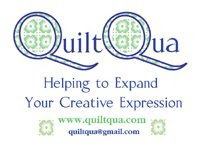 She shared the award with quilter, Renae Haddadin, How exciting for both of them and for me because I now have this pattern and you know I have tons of bright fabrics to make this beautiful quilt. "Alive with Joy" would be my title for this quilt....but they didn't ask me before going to press....imagine that....giggles. "Centered Beauty"....again...no one asks and I'm guessing they don't care...but I continue to self entertain. Elena Gregotti and Alex Veronelli (below) ....when you see them you know you are going to have an Aurifil Threads experience! I know I didn't hear anyone ask what is an Aurifil Thread experience did I? The Aurifil Thread experience can be seen in the movie, When Harry Met Sally....you know...the restaurant scene!!!! You'd have to watch that video over and over again to have the "multiple experience" when you see Aurifil's new collection....look at the beautiful drawers full of that luscious Aurifil Thread....drool bucket please. Rob Krieger, owner of Checker Distributors had a wonderful surprise yesterday and I was lucky enough to be within camera shot of his fun experience. Marilyn Wise from Pieces & Patches in Lexington SC gave Rob this beautiful wall hanging made up of several Checker T-Shirts. What a wonderful idea! Much more coming soon....I've got to get my co-workers back to "work." If you have read "Jean Creates" past few blog posts ( here and here) you know what I've been up to. A week ago Wed. I had the great fortune of heading up to Detroit Metro to pick up Jeannie W. for a week of FUN!!! Jean and I met 3 or 4 years ago through our blogs and we have become dear friends. I couldn't wait to see her again because she moved from Ohio to Washington State a year ago and I've really missed her. We both have an affinity for Kaffe Fassett, Brandon Mably and Phillip Jacobs fabrics. Jean decides we are going to stop petting our fabrics and actually use them. What a mind blowing idea ay? A blown out box of some of the most fabulous fabrics I have ever seen. YES, I did remind her that Possession IS 9/10ths of the LAW! I've never, ever....ever started a project like this one. Talk about excitement/anticipation/and drama (mainly the colors of the fabrics)....way too much fun. How the plan began...it was a book (un-named for sure!) Jean found and thought it would be an awesome way to begin and each of us could add to the others quilt. After a few hours actually using the book the book (definitely not a recommended book) idea was abandoned and we were on our own creating. I grabbed some of my most favorite pieces (the blades to the star) and built around that fabric with others that made the fan blades pop. Shall I mention that Jean had made her center block and was well into her first set of borders before I finished my center block? No...OK...I won't mention it. I wanted my block on point like Jean's block....so I measured and added some fabric to each side of my block. OOPS...came up pretty short so what to do??? Add some more fabric and hack off the rest naturally. You know what you get? You get a block that finishes at 17 7/8. Not 18"...nope...oh well...we had tossed the book by this time and I figured I'd just add more fabric and hack off the parts that didn't fit...FREEDOM! I wanted a fabric that would allow a place to rest before seeing more exciting prints....so I went into my stash in search of just the perfect fabric. Initially I hunted through my batiks...nope....then....WOWZERS....I came across a piece of Patsy Thompson hand dyed fabric that was perfect....absolutely perfect in my mind. I saw my Magic Stack N Wack book on my bookshelf...hey...I've never done that...I'm going to make some of those fun kaleidoscopes for my quilt. Might I suggest you actually read the book before "Wacking" into your fabric? I did not cut enough repeats so I ended up with 1/2 kaleidoscopes that I combined for my design. I liked this one the best. Ok....well.....hmmmm....I think I'll add these to the outside borders and not next to my main center block...back to the drawing board. My block now measures 24 1/2 x 24 1/2. Then it occurred to me....3.5 x 7 = 24.5 PERFECT...I just need seven 3/12 inch somethings to add to each end of the square. I cut up several pieces of white paper that were 3/12 inches wide by various lengths and began drawing different shapes to see what I thought would look good. The one I loved the most I couldn't use because I couldn't figure out how to paper piece it. Jean pointed out that I had only spent a day and a half trying to figure it out and if it were her...she'd move on and choose another block. What an epiphany! Then again...Jean shows up with these very FUN shoes..maybe if I had cool shoes like her's I'd be able to go faster? 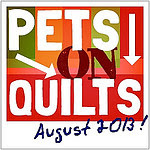 Pets On Quilts- Enter NOW!